Hearing the interest from governments and companies alike in implementing product stewardship initiatives. Courtesy of the senior management and staff of TES-AMM and Cimelia Resource Recovery, I was able to tour two of the largest electronics recyclers in the region and see precious metal recovery from computers, batteries and other e-waste. In addition to seeing molten gold being poured into ingots, one highlight was holding a kilo of pure gold recovered from electronics. The risk, of course, is seeing the gold and thinking that the electronics recyclers must be making a fortune. Most people don’t realise all of the commercial risks, inherent uncertainties and system costs necessary to end up with those precious metals. There was a variety of views on some of the barriers and opportunities of product stewardship, but many commonalities as well. The GlobalPSC will continue to explore these issues on behalf of our members. Product stewardship is a sensible approach to help ensure reliable volumes of end-of-life electronics are available for recovery and ensure these precious materials aren’t wasted in landfills. Of course, this also helps to ensure that manufacturers have these materials available as feedstocks and to avoid many of the life-cycle environmental impacts of extracting and initially processing the raw materials. 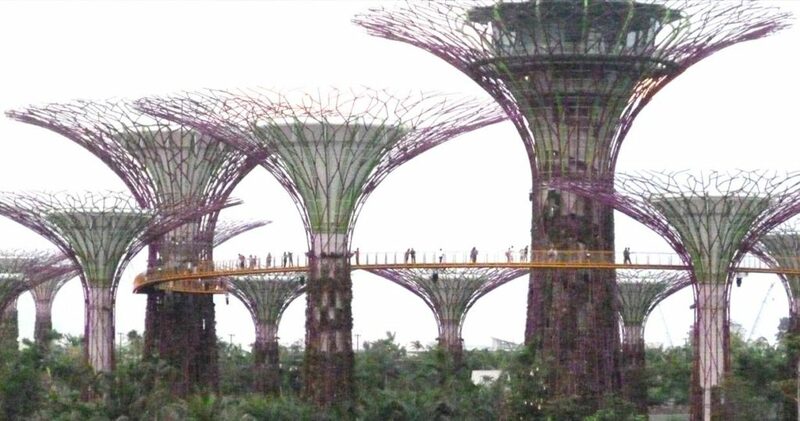 Gardens by the Bay opened just before our events and reinforces how man-made solutions can help redress some of the man-made problems we face. The ‘supertrees’ provide foundations for a wide variety of vegetation and solar panels for powering the precinct, serve as heat exchangers and help educate the public on the value of sustainability initiatives. With a little creativity and innovation, we can deliver effective solutions. While the Global Product Stewardship Council is truly international, has members from six countries and board members from four countries, we are based in Australia and have enjoyed strong support from the Australian Government as one of our first government members and as a sponsor of our inaugural International Product Stewardship Summit. Australia’s Senior Trade Commissioner in Singapore and her staff were especially helpful and provided the opportunity to meet with the Parliamentary Secretary for Sustainability and Urban Water, Senator the Hon Don Farrell. Senator Farrell led the passage of Australia’s Product Stewardship Act and had helped ensure that the GlobalPSC was active in its development. We are keen to continue working with governments and other stakeholders in facilitating the development of sensible, effective product stewardship programs globally. Public and private representatives from Southeast Asia to Africa were seeking advice on how to get product stewardship in place, and we anticipate many productive efforts in the future. Representatives of Singapore’s National Environment Agency shared insight on regional developments in product stewardship and introduced us to a wide range of award-winning industry leaders under the Singapore Packaging Agreement. As an example of the value in sharing program information, Australia’s packaging covenant had been a model for the agreement and adapted to suit local circumstances. We certainly appreciate the interest and engagement of all those involved that have helped us continue to expand our outreach, engagement and knowledge base.